BioWare's upcoming Anthem game isn't quite so upcoming anymore. Although it's technically not out out until February 22, you can actually play it right now - in full - on PC, and pay less than the RRP for the privilege. Yes, you read that right, you can actually play the full Anthem game on PC right now, courtesy of EA's Origin Access subscriber service. Well, specifically the Origin Access Premier tier, which costs just £14.99/$14.99 a month on a rolling contract that you can cancel anytime. 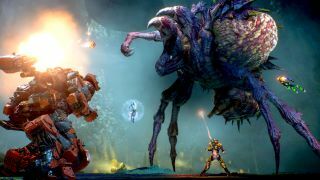 That means you can play Anthem right now on PC for just £15/$15. That's considerably less than the RRP, and you get to play it a week earlier than anyone else. Plus, if you decide Anthem isn't for you, you're only locked in to paying for Origin Access Premier for a month. Want to learn more about Anthem? All you need to do is sign up to Origin Access Premier - not the basic tier as that will only give you a 10 hour trial (read about the intricacies of when does Anthem come out here). You can do that via the EA Origin website or just within the Origin client on your PC. Of course, the beauty of an Origin Access Premier account is also that it doesn't just get you full and unfettered early access to Anthem. For that monthly subscription price you get all the other games the Origin Access Premier Vault has to offer, including Battlefield 5, FIFA 19, The Sims 4, Battlefield 1 and ALL its DLC, Darksiders 3 and more. Sweet.